Karen: Do you know what it feels like, followed and hounded and watched every second? Larry: I used to, but now I pay cash for everything. A pair of Paramount films (which have, through various gyrations, ended up in the hands of Universal) come to DVD. 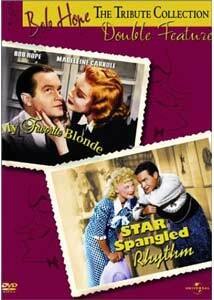 Both date from 1942 and exemplify wartime comedy and musical entertainment quite well. For those who are too used to the unfunny side of Bob Hope, you're in for a surprise. He's actually quite hilarious in this solo effort (though Crosby has a brief cameo). Karen Bentley (Madeleine Carroll) is an British secret agent who is carrying a gold scorpion that has the flight plans for a squadron etched onto it; she needs to get it to Los Angeles but is pursued by a gang of Nazi spies. Along the way, she meets Larry Haines, who is playing second fiddle to Percy the Penguin in a stage show. When Percy gets a Hollywood contract, he ends up traveling with Karen to the west coast, dodging the Nazis as well as the police. The script takes the wartime theme and really runs with it. The gags come fast and furious, and they're all delivered perfectly. Hope really shines in this picture, producing out-loud guffaws on a regular basis throughout the running time. Madeleine Carroll plays the straight woman, and does a fine job. Carroll had played in a similar situation in Hitchcock's The Thirty-Nine Steps, and there is even a scene here that directly parodies that picture. Even the MacGuffin in this film is completely absurd, pointing up the throwaway nature of whatever it is that's the object of pursuit in Hitchcock's thrillers. The pacing is excellent, and there's not a dull moment. The humor isn't terribly dated either, making it one of the more accessible comedies of the early 1940s. World War II saw the great blossoming of the movie musical and the gigantic production number. This musical not only features that, but nearly every star from the Paramount lot. Sailor Johhny Webster (Eddie Bracken) is on shore leave with his buddies, and is going to Paramount Studios where his gal Polly (Betty Hutton) works and his father, Bronco Billy Webster (Victor Moore) is executive vice president in charge of production. What Johnny doesn't know is that his father sort of fibbed, and is just a gatekeeper. But Polly is determined that Johnny not be disillusioned or embarrassed in front of his friends, so they wreak havoc around the studio trying to keep up the charade. The second half of the picture is devoted to the show that the pair manage to finagle for the sailors, complete with huge production numbers and blackout sketches from Paramount's many stars. Bob Hope has a few scenes and acts as emcee as well. There are a few good gags here, and there is a hilarious slapstick segment with Walter Darewahl & Company reminiscent of Harpo Marx's best work, but the real focus is on the show for the sailors. Obviously, this was meant to extend to all of the audiences in uniform and at home working for the war effort. The humor is mostly war-oriented, with gags on rationing, rubber shortages, swing shifts in munitions factories, and the like. But it's still pretty accessible with even a basic grounding in the history of the times. It's nifty to see the many stars here, as well as directors like Cecil B. De Mille and Preston Sturges poking fun at themselves. A particular standout is "Sweater, Sarong and Peekaboo Bangs," a musical number about the gimmicks that the female stars used, sung by Paulette Goddard, Dorothy Lamour and Veronica Lake. There's all too little Veronica Lake out on DVD, and it's a real treat to see her prominently featured in this musical number. Though the first half plays like a fairly pedestrian sitcom, the second half is first rate, with sketches by George S. Kaufman and others, and songs by Johnny Mercer and Harold Arlen. All the stops were pulled out here, and it shows. This makes for a very fun little double feature disc. Image Transfer Review: The images here are very good indeed. My Favorite Blonde is razor-sharp, with a gorgeous picture that simply looks great. There's lots of detail present, although there's a fair amount of grain as well. Star Spangled Rhythm looks almost as good for most part, though it suffers from a couple spots of major frame damage and some speckling around the reel changes. For the most part, however, it looks excellent as well. In the "Swing Shift" musical number, some of the finely-striped costumes will induce moir� patterns on the screen, but that's fleeting. The opening and closing credits are slightly windowboxed to avoid loss to overscan, a thoughtful little touch. Audio Transfer Review: Both pictures sound quite good considering their age. Blonde in particular sounds terrific. There is some mild hiss, noise and crackle in places on Rhythm. The musical numbers have good clarity, decent range and only minor distortion. Extras Review: Since this is a double feature disc, the extras are scant. There is a trailer for each picture, a set of brief production notes, and short (one or two-screen) bios and filmographies. The chaptering is decent for pictures of this length. A pair of Paramount pictures from 1942, with a sparkling transfer. Short on extras, but long on fun, this disc is worth a look for anyone with an eye for nostalgia, or looking for proof that Bob Hope can actually be funny.